Best Morocco Treks! Book Now! This is perhaps one of the classic day treks starting from Imlil. It is ideal also if you are staying in Marrakech as you have the opportunity to enjoy the trip up to Imlil passing through Berber villages and valleys as you wind your way up into the High Atlas. It affords superb views of the valleys below and mountains and high passes on the other side. Colors change from grays to reds and purples as the geology alters. You can rest at the pass and have a picnic lunch as well as some freshly squeezed orange juice from the small hut at the pass. The return hike is down the same path with a deviation to discover the small villages on the opposite side of the valley to the start point. One day trek from Imlil to Tizi Mzik. Transfer from Marrakech at 07 am by comfortable air conditioned minibus, 4x4 or local taxi to the trailhead village of Imlil, passing through verdant valleys and Berber Villages, market towns and lush landscapes full of fruit trees, surrounded by the breath-taking panoramic views of the peaks of the High Atlas Mountains. Once in Imlil, after a welcome glass of mint tea, we start out trek. Our mule will carry the lunch and extra water. This is a steep climb on scree so care must be taken in parts. The effort however is well worth it when you see the far reaching vistas on either side of the pass. If the man is there, you can purchase freshly squeezed orange juice; usually 15 dirhams per glass. Our muleteer will prepare a delicious picnic lunch while you relax and take photos. The way down is on scree; so again, take care. 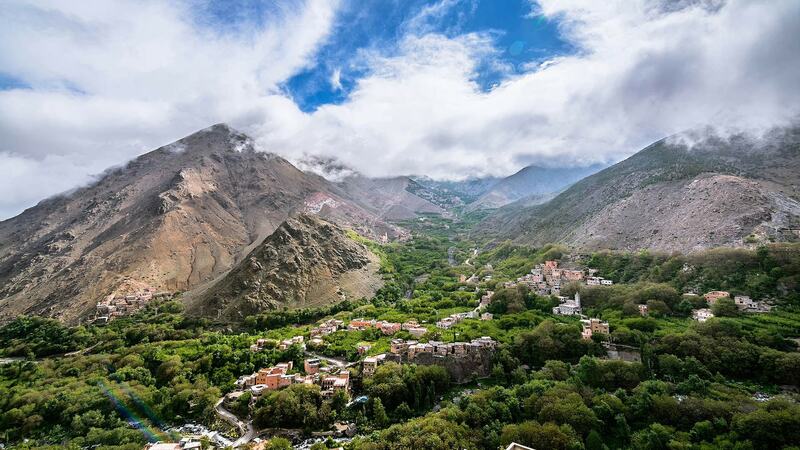 We will take the opposite side of the valley to discover some of the other Berber villages before returning to Imlil. You can take the transport back to Marrakech, or perhaps you would like to stay locally and enjoy the culture. Trek time is approx 6 hours.